World's Top Diplomat -- It's Guterres Of Portugal! UNITED NATIONS - In a surprisingly quick decision, the 15 members of the UN Security Council stood in a row to show they were united behind the candidacy of Antonio Guterres, a former UN refugee agency chief and an ex-prime minister of Portugal. "Today after our sixth straw poll we have a clear favorite and his name is Antonio Guterres," announced Russia's UN ambassador, Vitaly Churkin, this month's Council president. His 14 colleagues flanked him -- all of them men except for US Ambassador Samantha Power. Guterres will be the ninth secretary-general in the 71-year history of the United Nations. That was on Wednesday. On Thursday, the Council adopted a formal resolution in a secret session by acclamation to approve Guterres for a five-year term, Churkin told reporters. The nomination then goes to the 193-nation General Assembly for final approval, probably next week. Guterres, 67, succeeds Secretary-General Ban Ki-moon, 72, of South Korea, who ends his 10 years in office on December 31. Guterres' spirited presentations captured audiences during public debates organized for the first time by the General Assembly, in a move to make the process more transparent. His tenure at the refugee agency (UNHCR) was marked by some of the largest flow of displacements since the end of World War II - from Syria, Iraq, South Sudan, Yemen, Libya and the Central Africa, Republic and many other regions. The same issues will haunt him as the 9th secretary-general of the world body where diplomats hope he will use his bully pulpit to gather support, despite the tension between Russia and the United States. Guterres obviously is neither a woman nor an East European, albeit strong lobbying in and out of the United Nations for the first female secretary-general and Russia's stated preference for an East European. Whether he made any promises is not known. The posts of undersecretary-general for peacekeeping and for political affairs are coveted jobs with all five permanent Council members lobbying for them. (United States, Britain, France, Russia, China). Churkin said Russia would like a "senior level" post but said there were no commitments yet. While most American media - particularly in this election year - pay scant attention to the United Nations until scandals emerge, Washington pays 22 percent of the regular budget of $5,4 billion and 28.5 for the peacekeeping budget of $8.27 billion, which has more than 100,000 personnel. Guterres told UN reporters that "prevention prevention prevention" was his priority rather than constant peacekeeping when there was no peace to keep. "In no other place in the world we have a chance to address the root causes of human suffering, "he said. At another time, he said, there was a need to confront and defeat "populism, xenophobia, racism and violent extremism," values he has fought against. Jose Ramos-Horta, the former president of East Timor, called Guterres "a good man, a compassionate and humble leader." He quoted former President Bill Clinton, in a 1999 conversation as saying: "It was Antonio Guterres who most touchingly and persuasively pleaded with me to do something," a reference to a shift in Washington's pro-Indonesia stance after massacres in the former Portuguese colony. Several of the other candidates, including Helen Clark, a former New Zealand prime minister and head of the UN Development Program and Irina Bokova of Bulgaria, the director of UNESCO, sent out tweets immediately congratulating Guterres. Another candidate, Christiana Figueres called the result, "bittersweet." "
Bitter: not a woman. Sweet: by far the best man in the race. Congrats Antonio Guterres! We are all with you." US Ambassador Samantha Power, said: "In the end, there was a candidate whose experience, vision and versatility across a range of areas proved compelling, and it was remarkably uncontentious, uncontroversial." British Ambassador Matthew Rycroft said he was pleasantly surprised that the Council came together. "Let's face it - behind the person who was the leading candidate from the very start of this race. He said his government favored a "strong" secretary general "who will provide a convening power and a moral authority at a time when the world is divided on issues, above all like Syria." Louis Charbonneau, the UN director at Human Rights Watch, said that "With Antonio Guterres, the Security Council has chosen an outspoken and effective advocate for refugees with the potential to strike a radically new tone on human rights at a time of great challenges." Guterres was ahead in all the previous five straw polls although until Wednesday no one knew how the five veto-bearing members voted. They received red ballots while the 15 elected members had white ones, but names were not revealed. A winning candidate has to have nine votes in favor and no veto. Among the 10 remaining candidates, Guterres received 13 in favor, none against, and 2 "no opinion." He was followed Slovak's foreign minister Miroslav Lajčák with seven in favor, six against, including two permanent members. Next came Serbia's former foreign minister, Vuk Jeremic, who had the same score except for three negative votes from permanent members. Irina Bokova of Bulgaria, the director of UNESCO was in fourth place followed by Helen Clark of New Zealand. In sixth place was Susan Malcorra, Argentina's foreign minister and a former high-level UN official. In seventh was Danilo Turk, the former Slovenian president. Kristelina Georgiava of Bulgaria, the EU budget commissioner, was a last minute candidate who could not enter earlier because her country had been backing Bokova but then switched support. They both stayed in the race. She ranked in eighth place. Antonio Manuel de Oliveira Guterres, studied at the Instituto Superior Tecnico in Lisbon with degrees in engineering and theoretical physics. He taught physics during the turbulent years, 1966-1971, when the fascist government of Prime Minister Antonio Salazar wobbled and came to an end in 1968. Fluent in Portuguese, French and Spanish, he began his involvement in politics, as a member of the Socialist Party, albeit its Christian conservative wing. He became a parliamentary deputy and then secretary-general of the Socialist Party. In 1991, he founded the Portuguese Refugee Council. As prime minister, from 1999 to 2005, he emphasized education and health and led the drive for international intervention to halt the violence in East Timor, a former Portuguese colony, following the Timorese vote for independence. Australia and New Zealand sent troops to stop the massacres, mainly from Indonesians. Portugal since 1999 has granted more than $350 million in aid to East Timor, known as Timor Leste. On women's issues he campaigned against abortion and the rights of gays. But 20 years have passed and Portugal has revised both positions. Ban Ki-moon, in addition to his signature climate change efforts, has been outspoken on LGBT rights and given UN staff privileges, accordingly. Guterres has been married twice and has two children by his first wife who died of cancer in 1998 while he was prime minister. He is married to Catarina Marques de Almeida Vaz Pinto. Russia's Vitaly Churkin announcing results. 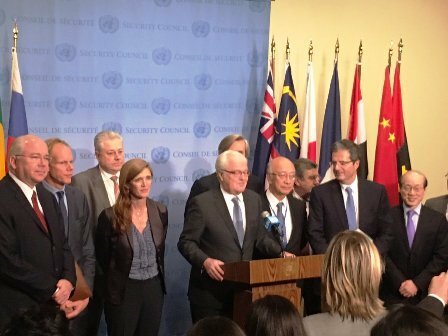 US Ambassador Samantha Power is only woman on UN Security Council.